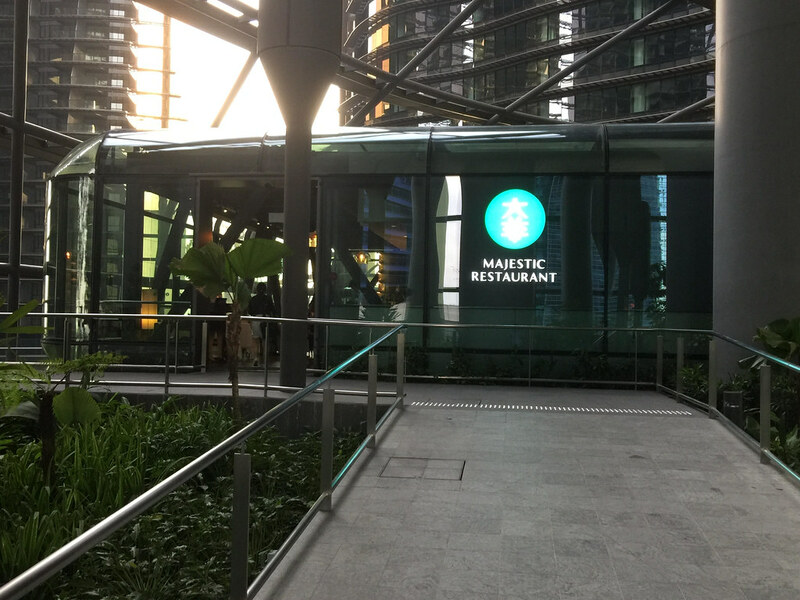 Majestic Restaurant which used to be housed inside the New Majestic Hotel has found a new home at Marina One. The new restaurant is bright and spacious with floor-to-ceiling glass windows, Italian stucco walls and dark wood floors. Fans of Majestic restaurant will be able to spot paintings by contemporary Chinese painter Li Jin around the restaurant which has been brought over from the previous location. Even the original signboard has been retained. The beautifully sliced Crispy Mangalica Pork Belly Marinated with Five Spices ($14) got me salivating with its 65-70% fat to 30-35% lean meat ratio. 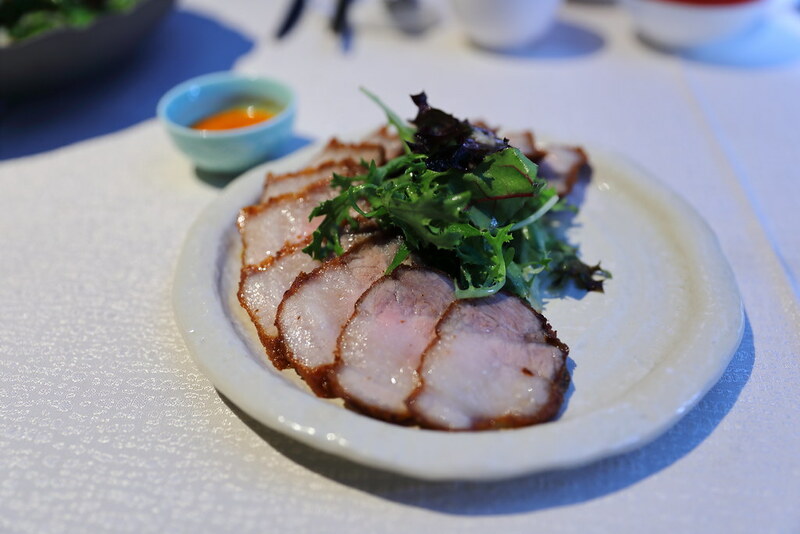 Considered as one of the tastiest pork in the world, it doesn't have that porky taste, it fact it was kind of clean tasting complemented by the five spices rub on the crispy skin. 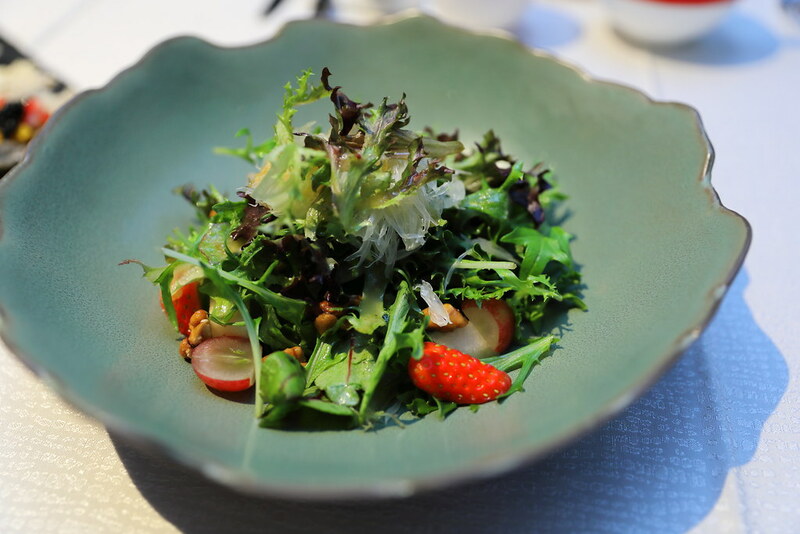 A refreshing and healthy dish on the menu is the Organic Greens with Pomelo in Lychee Dressing ($12). I thought it is rather unusual to have a salad dish in the menu of a Chinese restaurant. Saying that, it will be a welcome option for vegetarians and office worker in the area. Having crispy skin alone may be a bit boring but how about topping it with caviar and some fruits. 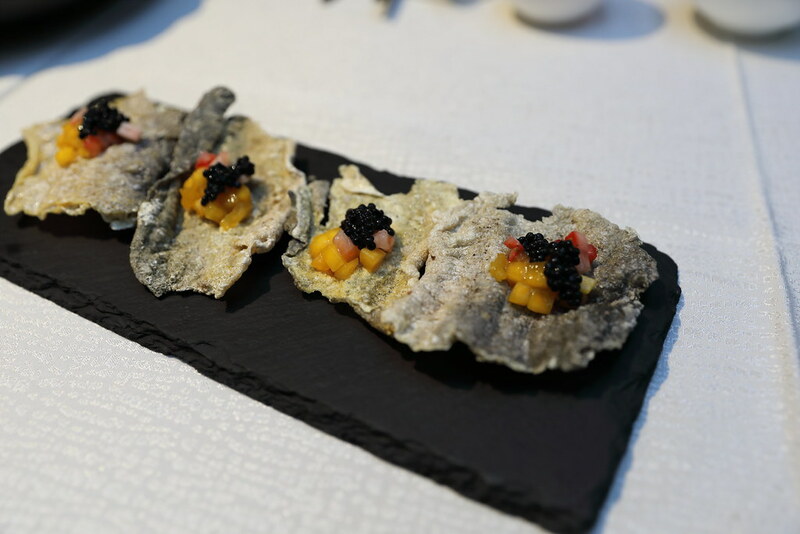 The combination of saltiness and sweetness, on top of the crispy fish skin makes the Crispy Fish Skin Topped with Caviar ($12) a delightful snack to kick start the dinner. 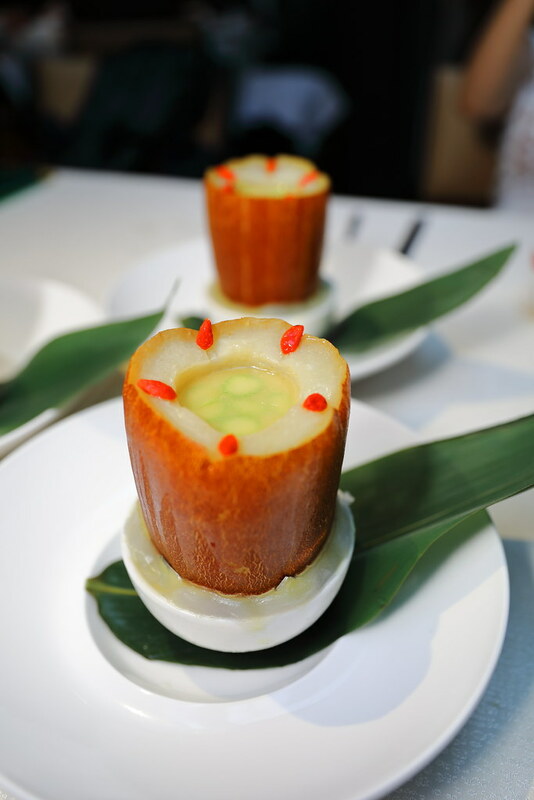 Making a towering entrance is the Double-Boiled Seafood Clear Soup served in Whole Yellow Cucumber ($18). Besides the robust and flavoursome soup, and the seafood in the yellow cucumber, I also applauded the addition of the diced vegetable stem for the extra crunchiness. The Sauteed Boston Lobster with Trio Onions ($68) is a new to me. 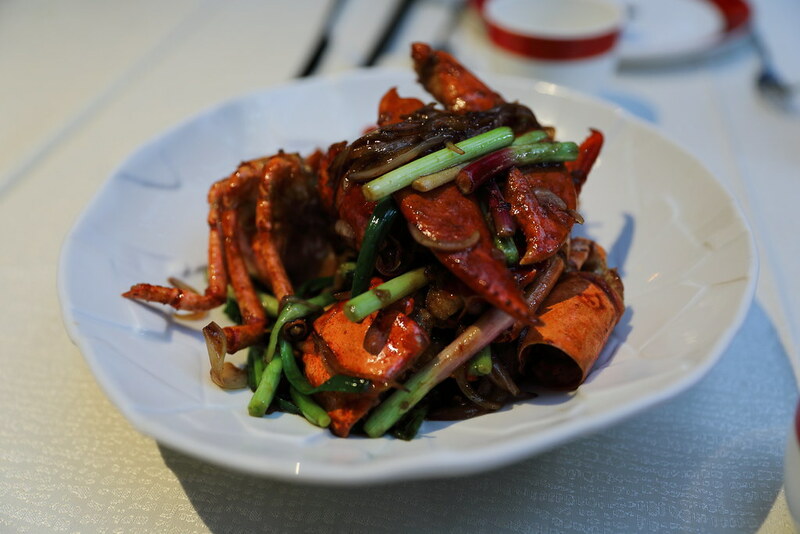 I have tried several ways of cooking the crustacean but this is a new to me, especially how the spring onions perfume the dish, elevating the whole dimension of the dish. 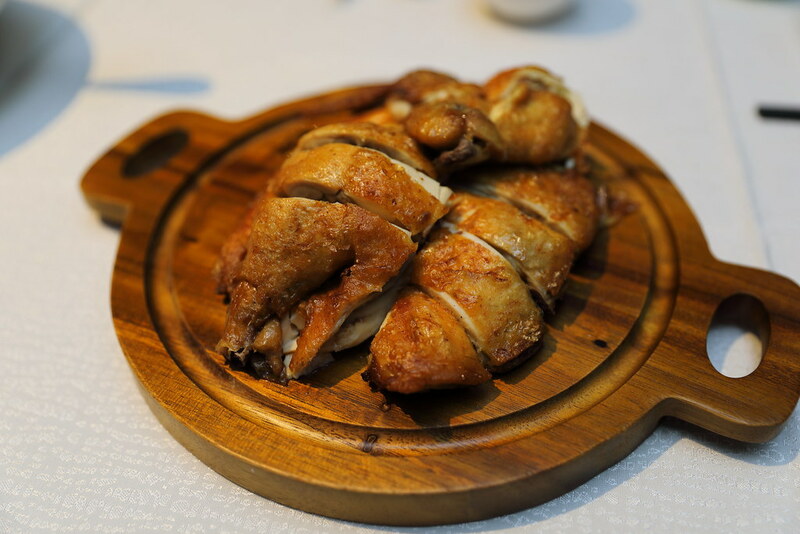 The highlight at Majestic Restaurant has to be their new item, the Smoked French Corn-Fed Chicken with Salt and Hickory ($28). It is limited to about 6 portion each day, so you to pre-order if you want to try it. The corn-fed chicken has a subtle sweetness that is infused with the smokey aroma of hickory. 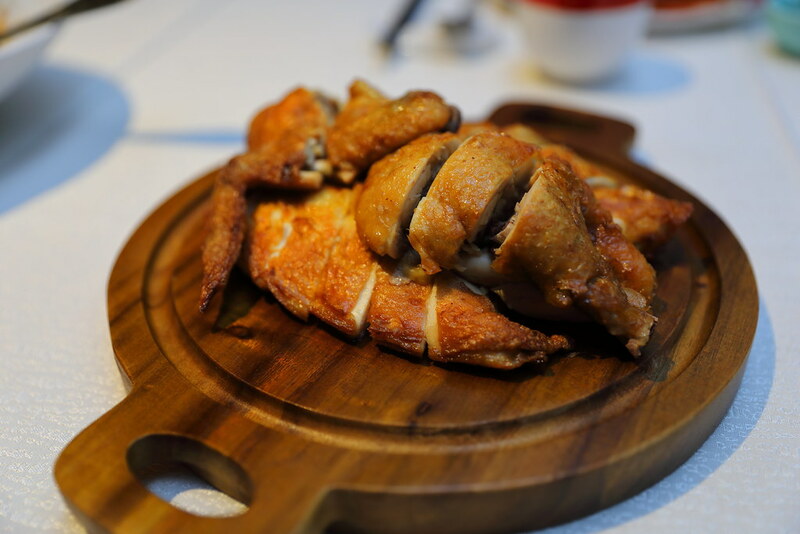 Not sure whether it is due to the breed, the chicken skin is thicker, allowing one to appreciate the crispiness more. A comforting end to the mains before moving to the desserts is the Black Truffle Fried Rice with Crabmeat and Egg White ($20). 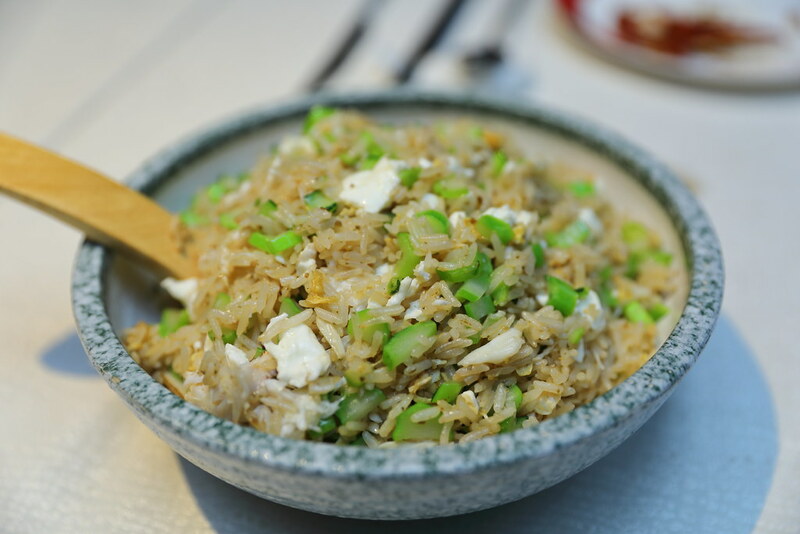 The rice has been cooked to an enjoyable fluffy bite, with diced vegetable, crabmeat and egg white. I was initial worry that the addition of the black truffle essence would leave an oily aftertaste but it turn out not. Instead it gives the fried rice an aromatic boast. 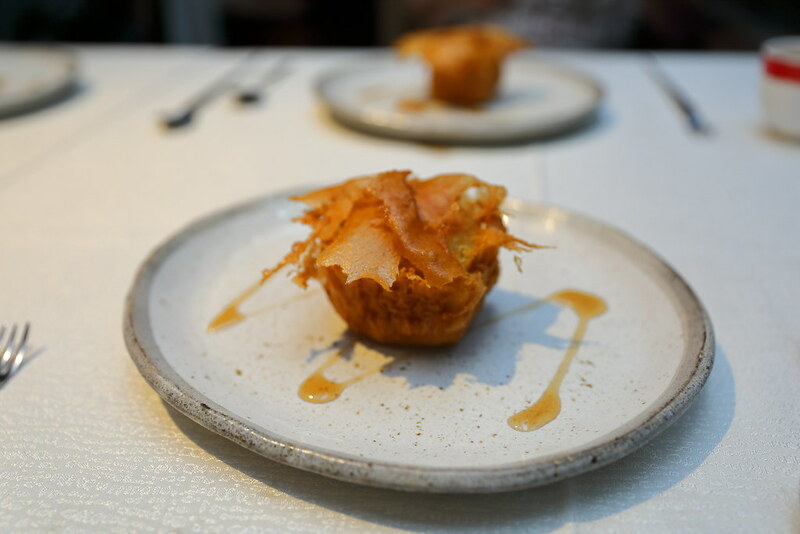 Durian lovers will be rejoice with the Crispy King of Durian with Maple Syrup ($10). Diner will get a whole block of durian ice cream encased in a crispy batter, drizzled with maple syrup. 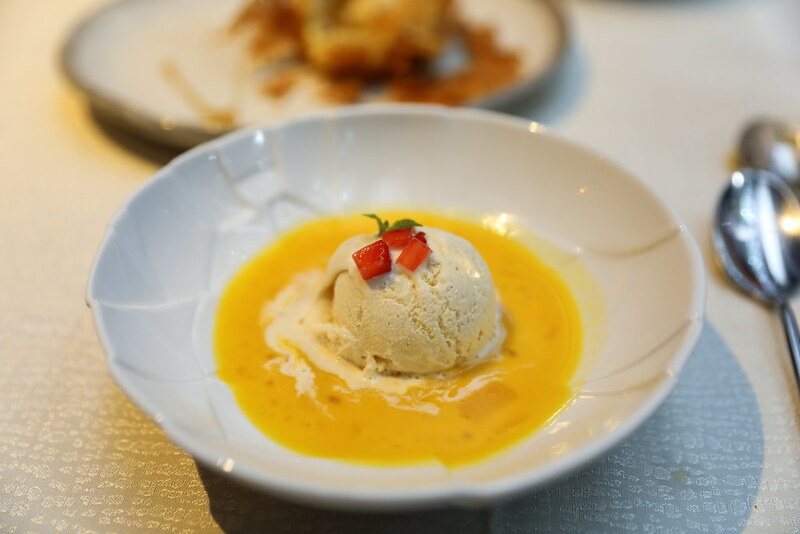 Another dessert I had is the Chilled Mango Puree with Vanilla Ice Cream, Sago and Pomelo ($8.80). Nothing fancy but a refreshing and sweet dessert to wrap up the dinner. It is great to see Chef Yong Bing Ngen and Majestic Restaurant back with a refreshed menu and new location at Marina One. In addition to the contemporary Cantonese food rooted in traditional Chinese culinary techniques, Chef Yong has also introduced a full selection of dim sum for lunch, as well as set menus starting from $48 per pax for lunch and $68 per pax for dinner. Ridiculously tasty food at really affordable prices. Wine good too and staff very helpful. Great place.